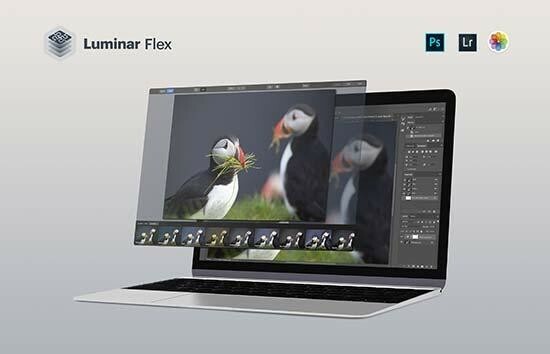 BELLEVUE, WA - April 4, 2019 — Today, Skylum Software announced Luminar Flex, a plugin that offers unique and powerful editing features to help photographers elevate the creativity of their images. ● Accent AI: Automatically analyzes and corrects photographs using more than a dozen controls at once. Accent AI can be a great substitute for several traditional controls such as shadows, highlights, contrast and more. Think of it as the best Auto button you’ve ever clicked, but you still maintain control. ● AI Sky Enhancer: Turn gray and uninspired skies into something magical with AI Sky Enhancer. By automatically detecting the sky in a photograph, AI Sky Enhancer makes the necessary adjustments to increase color, clarity, and detail, allowing to boost your outdoor images with a single slider. ● Details Enhancer: Creates dramatic photos with crystal-clear sharpness. This filter unlocks details for sharp looking images without halos or artifacts. ● Golden Hour: Brings a warm-toned sunlit effect to your photo This filter emulates the shooting conditions when the sun is low on the horizon (such as shortly after sunrise or before sunset). This indirect light helps make even dull photos warmer and more dimensional. ● Orton Effect: Allows enhancements to an image that include glow and focus. This produces a unique look that’s both sharp and blurry at the same time. It’s perfect to create an emotional feeling in a picture. ● Image Radiance: Gives an overall "dreamy" look by adding a glow to the lighter areas of the image. This is a great filter to use for portraits and even landscape photos to create soft, saturated results. ● Foliage Enhancer: Elevate colors often found in spring grass and fall leaves to make landscape photographs that pop off the screen. ● LUT Mapping: Apply Lookup Table (LUT) files for creative color grading and film stock emulation. ● Luminar Looks: More than 70 one-click Looks give photographers a speedy jump-off point for creative explorations. Easily dial in the right look with the Amount slider or customize the recipe and save a new Look. ● Expert: All essential tools that professional photographers need for image processing. ● Black & White: Optimized for creating black and white masterpieces. ● Image Aware: Smart Workspace for fast and high-quality image-aware processing thanks to the power of AI. ● Intensify: Boost the details and structure in the photographs to get very clear and detail-rich image. ● Drone & Aerial: Essential tools for quick edits of drone photos. ● Film Lab: Tools for emulating the style and effects of film photography. ● Relight and Color: Essential tools for creative photography. ● Portrait: Optimized for creating beautiful portraits shot under any light. Yet another benefit of Luminar Plugin for Lightroom users is an ability to use Layers and Blending modes. With Adjustment Layers it’s easy to apply any of the filters to flexible layers. These as well as textures can be mixed with blending modes for new results or have their opacity adjusted for mixing things together. It is also possible to use textures, images, masks and more for the ultimate in creative filtering.